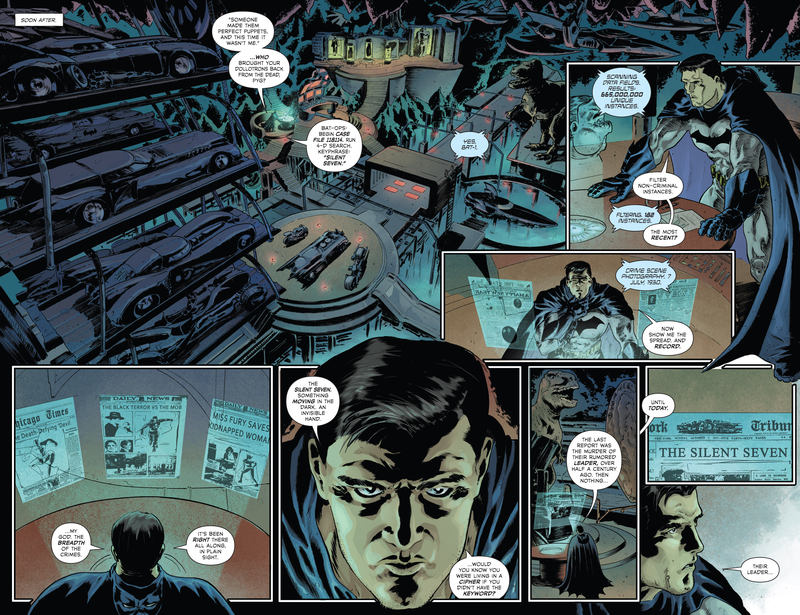 scans_daily | The plot of The Shadow/Batman's got scope. (I assume the headlines were explicitly mentioned in the script, because Steve Orlando's casual acknowledgement of shared universes is a thing. (That is not the immediate aftermath of The Final Problem. 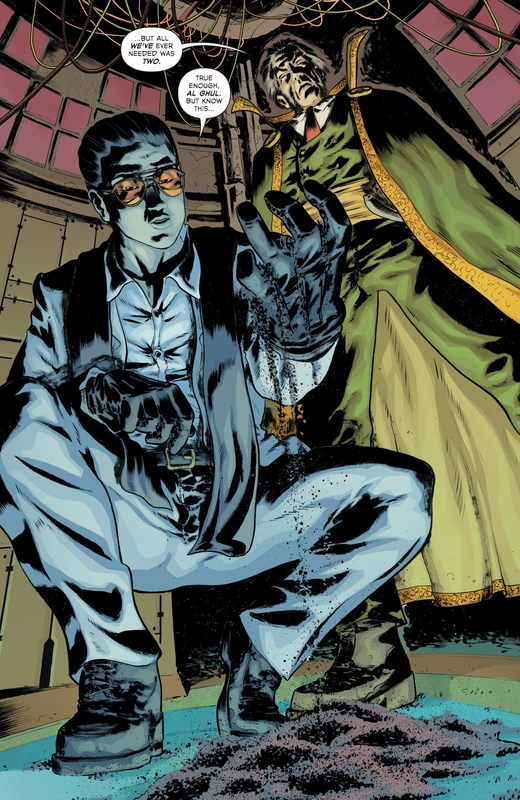 In this week's #2, the Silent Seven's masters punished their servants for failing to kill Robin.
" Moriarty may have needed the Seven to rule the world, Khan. We keep the name in his honor.. "
In the Batcave, Robin- Damian- turned and left. He went to prove himself to his father by handling the Silent Seven on his own. Batman turned to the Shadow, who'd come there with Robin after helping him with the Seven's servants. They argued with words and fists. Their argument ended with truths. 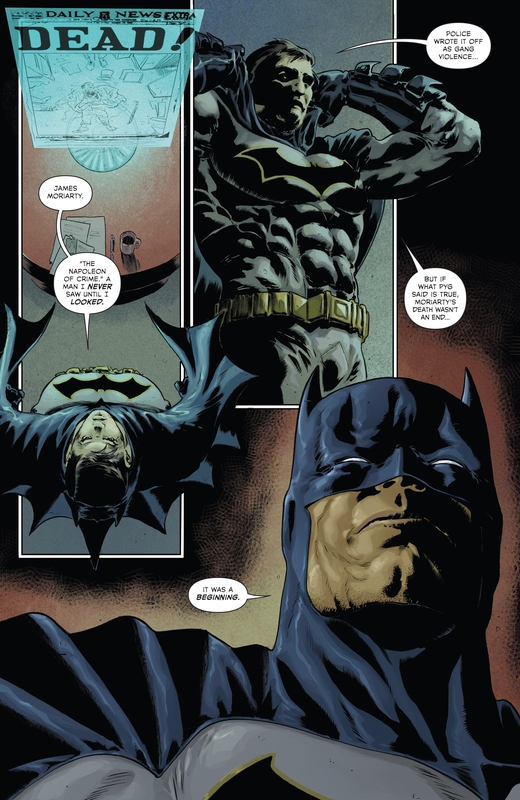 Batman offered the Shadow the opportunity to deal with those truths by working with him against the Seven. 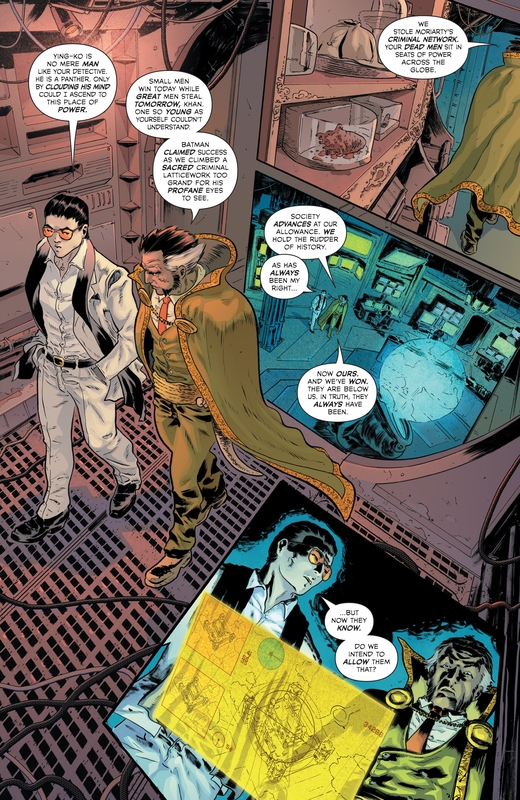 Every time Bruce introduces someone as a long lost relative I imagine the people who don't know about his double life are wondering, "wait, why was he raised by the butler?" Actually I've been wondering the same thing since I found out he had an actual uncle on his mother's side. Guess the Wayne/Kane feud must run really deep. Back in the Silver Age, Uncle Philip did raise Bruce after his parents died (along with his housekeeper, Joe Chill's mother). I assume they dumped that because Alfred is way more interesting, and that being left without any family is more tragic. Which means introducing new relatives undermines that story. 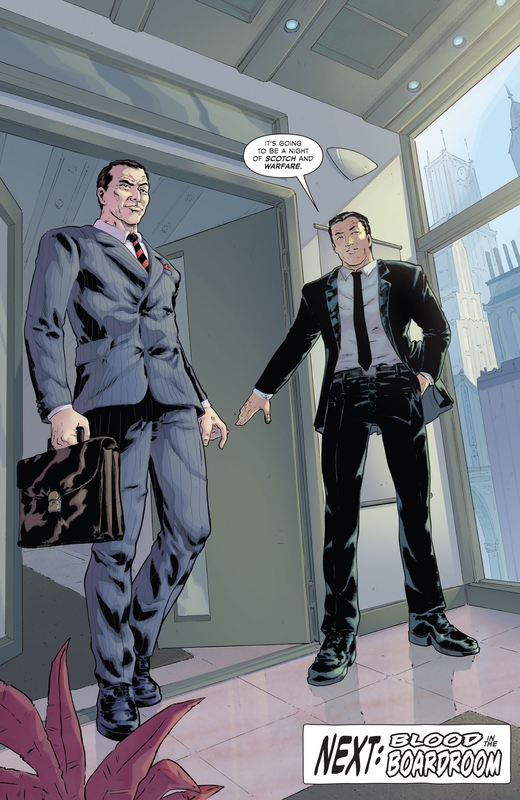 Turns out Bruce Wayne had two uncles who could have raised him, Philip and Jacob*. *also a secret evil brother, a cousin, and a secret evil cousin. And Jacob was also secretly evil. 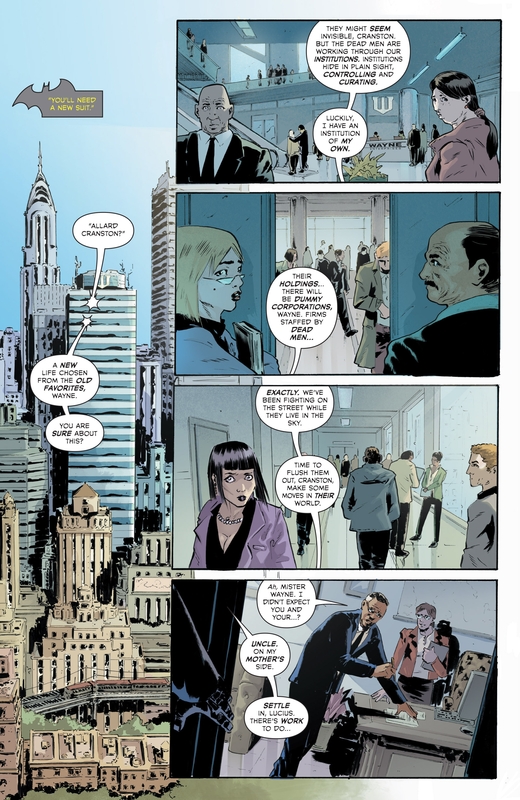 Looking at the first panel there and all I can think of is "Jeez, Bruce, got enough cars?". I do love the affectionate look at all the various Batmobiles, but still. That's a first, right? There have been panels showing the cave and all the different batmobiles housed inside, but this is just racks on racks on racks of what appear to be mass-produced Keatonmobiles. I also just noticed, way up in the top right, 3, maybe 4, different Batplanes too. When does Alfred decide to hold an intervention and have Bruce put onto one of those "Extreme" Hoarders type shows? LOL.